The Scoop: London-based relationship coach Olga Frankow empowers women in the corporate world to cultivate the loving relationships they deserve. She offers sage advice on how to balance work, love, and family based on her own experiences. Olga worked in a corporate job for 10 years and has been happily married for several years. While pursuing her career, she strengthened her marriage by setting clear priorities, paying attention to her partner’s needs, and working toward their goals as a team. Today, Olga runs private coaching sessions and hosts monthly meetups for women looking to expand their social circles and learn how to improve themselves. Her continual support inspires women to make choices that will lead them to a joyful and well-balanced life. Relationship coach Olga Frankow has found her niche in speaking to high-powered women. Dating and relationship expert Olga Frankow challenges that notion. She argues that women can successfully cultivate a healthy work-life balance and thrive in their careers as well as in their personal lives. How does she know? Because she has done it. She pursued a corporate career for over 10 years with the support and love of her partner Rafael. She has learned how to balance her work goals with her family goals, and now she has founded a premier coaching business in London to share her insights with women in the workforce. Olga addresses the dating and relationship challenges faced by modern women and offers supportive guidance through group coaching, advice articles, and speaking events. She also offers face-to-face consultations with women truly committed to resetting their expectations and changing their lives. Olga works with professional women who range in age from 33 to 45, on average. She said she is drawn to women who work in the corporate world because she can relate to their experiences. She often forms tight bonds with her clients, answering their texts and giving advice on the fly, and she motivates them to take their love lives to the next level. Her coaching style is encouraging and empathetic. She doesn’t boss her clients around — these strong women know how to run their lives — instead, she guides them to draw conclusions about what they’re doing right and what they could do better. One-on-one coaching sessions prompt women to work on themselves and improve their relationships. Her coaching business has thrived by tapping into the unique challenges faced by modern women in the dating scene. In the coming years, Olga plans to lead speaking engagements geared toward empowering women across the UK. She said reaching out to women is a high priority for her because she has seen many career women feeling bogged down by the pressures of modern dating. She pushes women to consider their actions and discuss their long-term goals with their partners to make sure they’re on the same page. Taken as a whole, Olga’s advice helps women create balanced lives through thoughtful, concerted efforts. The more she spoke to women in the workforce, the more Olga realized that their issues were universal, and yet they felt isolated by their struggles. They were carrying their burdens alone. The relationship coach offered them support in one-on-one sessions, but she believed she could have a greater impact on their health and happiness by bringing her clients together and encouraging them to support and advise one another. Olga has organized a women-only Meetup group to discuss modern dating and relationship issues. So, Olga formed a monthly meetup called Love and Relationship Talks for women in central London. The meetup focuses on how to balance great careers and great relationships. Whether they’re dating or married, these women can relate to one another and brainstorm solutions to their personal problems. Sometimes the meetings dwell on practical ways to, for instance, rekindle the spark in a marriage or get on the same page about the future with a partner. 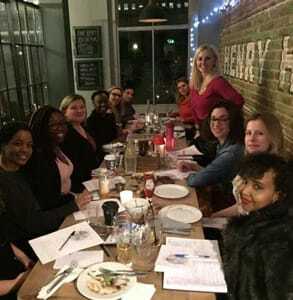 The meetup currently has over 150 members, and that number is growing all the time as more women hear about what she’s doing and want to be part of it. Olga guides the discussion at these educational events and makes sure the women stay positive and support one another’s goals. Olga’s Meetup group provides a support system where women can discuss what’s going on in their lives and realize they’re not the only ones struggling to balance work, love, family, and friends. Olga has created a safe space where women don’t have to play a role — they can just be themselves and think about what it is they want and what they’re working toward. Coaching isn’t the only way Olga influences modern daters. She has also written a downloadable ebook packed with sound dating advice. 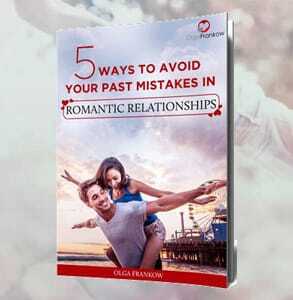 She wrote “5 Ways to Avoid Your Past Relationship Mistakes” to ensure women learn from their dating missteps and move forward in a healthier direction. Olga’s ebook motivates singles to stop repeating the same mistakes in the dating scene. The book discusses the choices single women make and how their false beliefs or unrealistic expectations can lead them to fall for someone who isn’t right for them. This is a step-by-step guide for serious daters who are ready to make a change. Olga teaches women how to maximize their chances of meeting a stable partner and building a relationship, so they stop wasting time on bad dates and toxic relationships. She starts by helping readers identify what’s going wrong and ends by giving them a strategy to making it right. Self-reflection is a major theme throughout the book. Olga challenges readers to take ownership of their mistakes and get clarity about what they want from a relationship and what they are willing to do to get it. Some people say that women can’t have it all, but Olga begs to differ. This professional relationship coach has spent the last few years delivering an empowering message to the career-driven women working hard to achieve their dreams. It is possible, she explains, if women go in with the right mindset and the right partner. Looking to the future, Olga’s goal is to help women in power positions cultivate greater success, joy, and fulfillment in all areas of life. She has started by creating a network where they feel safe and supported. She brings women together in monthly meetings to show them that they’re not alone and to give them an outlet to discuss their problems and work toward lasting solutions. Whether she’s sharing a story on Instagram or giving a speech to a corporate audience, Olga motivates women to think more positively about their lives and what they can accomplish.